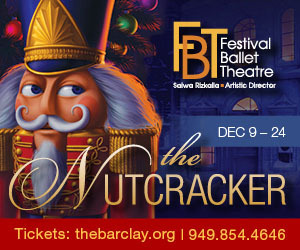 Los Angeles Ballet's The Nutcracker is LA's ultimate family holiday tradition, perfect for celebrating the season. Set to Tchaikovsky's iconic score, this original production takes place in 1912 Los Angeles. You will be captivated as Clara and her beloved Nutcracker battle a most memorable Mouse King, encounter dancing Snowflakes and travel to the Palace of the Dolls.